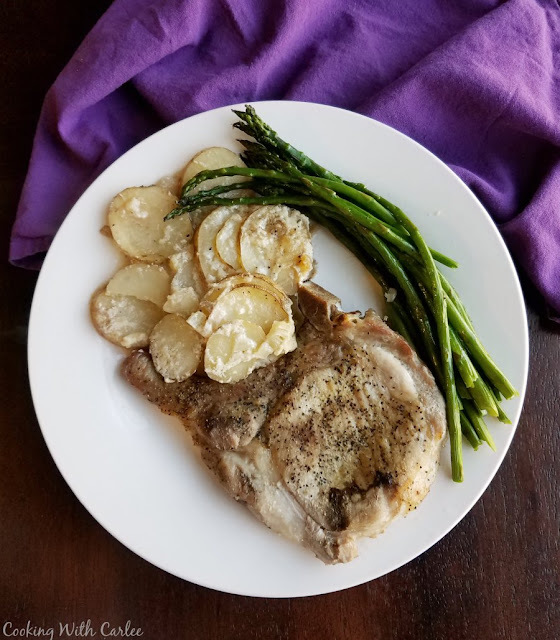 Make your pork chops and scalloped potatoes in the same pan for even bigger flavor and fewer dishes! Maw-Maw definitely had the right idea when she started making this delicious dinner! Carlee and I have been after Maw-Maw to share some of her recipes with us. We couldn't understand why we were receiving any. It turns out that she didn't use recipes for the things she cooked. She usually just cooked. We understand because even if we have a recipe, we tend to make up our own version. I called Maw-Maw and she coached me through this recipe. This is one I remember eating quite often when I was a child. I believe Bob, Bonnie and I liked it a lot. I started helping my mom cook meals when I was fairly young. She worked long hours some days, but still wanted us to have a nice home cooked dinner. I have probably made this recipe hundreds of times, but it really took some thinking to make a recipe for it. I guess that's the way it is when you're used to just throwing things together. This turned out just the way I remembered it to be. These are the only scalloped potatoes that I have ever seen that are made without cooking the white sauce first. The sauce just magically thickens as it bakes. You can make them without the pork chops on top. The pork chops make this dinner extra flavorful. I hope your family enjoys this as much as I did growing up. More of Maw-Maw's recipes will be shared soon. Her love for cooking may not be as strong as mine, but what she does make is perfection. I'm glad she taught me to be independent in the kitchen. I'll always remember the first meal I cooked. It was for a Girl Scout badge. I'll share that sometime also. Any comments helping encourage Maw-Maw to write out and share some more of her recipes would be greatly appreciated. I consider heirloom recipes to be like a tasty family tree. 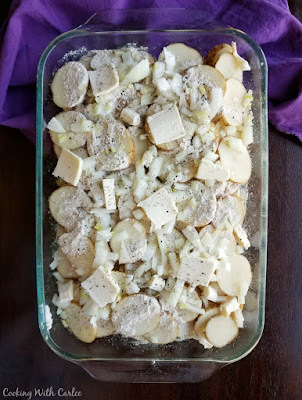 Season with salt and pepper, top that with remaining potatoes, onion, flour and butter. Remove cover and bake for another 30-45 minutes. The pork chops should be tender. I really like it when the potatoes get a little brown around the edges. That is my favorite part, yum! Carlee , im so glad that you are taking the time to post the recipes that have been in our family for generation. It's fun to know that these recipes will be passed on to your siblings and Jaxon. Others that stumble upon or follow your blog will be thankful too. I hope this meal and others you share will make many families happy they tried the recipe. 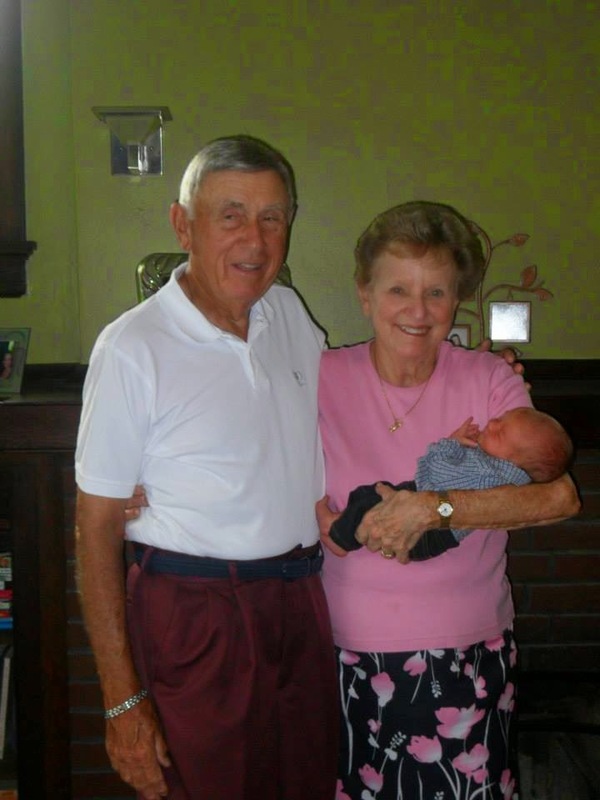 Nobody could be happier than Maw Maw and Paw Paw are with Jaxon though. It has been a lot of fun cooking some old family favorites and trying out some new things! A hearty one pan dinner! Thanks for stopping by. It is really good, and fun to have some of my grandma's recipes! Thanks for stopping by! I love that you are sharing family favorites. I hope she does too! I hear she used to throw a mean dinner party, so it would be fun to see what she did. I think it has been long enough since she through a party, she doesn't realize how many good things she made! 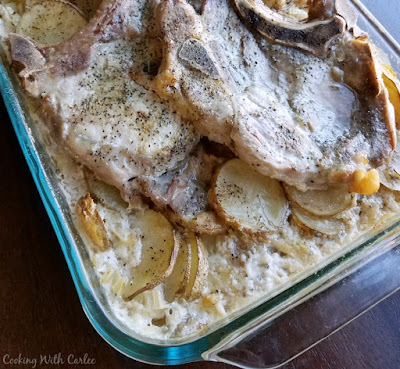 Maw-Maw's scalloped potatoes and pork chops recipe sounds delicious, pure comfort food! I love that it all bakes together in one dish, pinning to try soon for my family :) Thanks for sharing at What'd You Do This Weekend?! It is a very hearty one dish dinner! Thanks as always for hosting and stopping by! I love your Mimi's recipe it looks delicious, family recipes are the greatest! Thanks so much for sharing with Full Plate Thursday and have a great weekend! It is fun to try the things that my grandmas used to make, but don't necessarily make now when we all get together for dinner. And it never hurts to have another one pot meal in your back pocket. Thanks as always for hosting! It is very hearty and delicious! It has been so much fun trying recipes my grandmas made... or had as a kid. Thanks for stopping by! Hi Mi-Mi & Carlee, guessing and tweaking is part of the joy of cooking, don't you find? One pot recipes are my favourite, and the chops being cooked on top of the potatoes would make this recipe nice and tasty. My boys would go crazy for this meal!!! 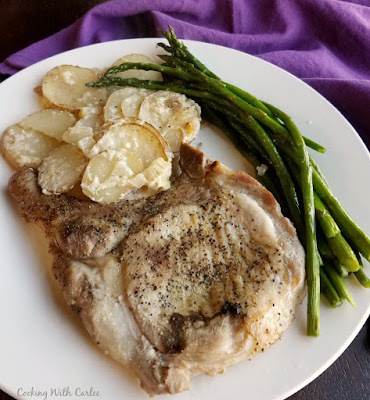 Pork chops and potatoes...one of the best combinations EVER!!! This recipe may just find its way to my kitchen very soon! MORE FAMILY RECIPES PLEASE!! There's nothing better in my book than an old fashioned recipe. This sounds sooo good! It brings back a memory of a dish one of my grandma's made. I will definitely make this soon. Hoping to see more of Maw-Maw's recipes! I love that you are getting your family recipes down on paper. What a great thing to have them on your blog. It will be such a treasure for generations to come. Keep them coming Maw-Maw! I am glad to be getting them down too and I agree, come on Maw-Maw!